Hello! 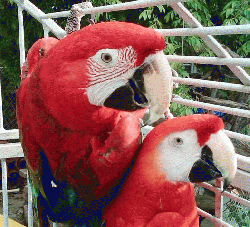 I`m AyatLeila, or Aya for short, and I am a beautiful Scarlet Macaw girl of about 7 years. I`m not a big talker but I do laugh and I love mist baths. I came to Mickaboo with Viridian Rose and BG after our owner passed away. Viridian Rose is my bestest pal and we`re looking for a home were we can be together. We`re very sweet birds. UPDATE: Our foster parents have realized how much they really love us and are adopting us!! !